New Delhi: Government of India, Ministry of Personnel, P.G. 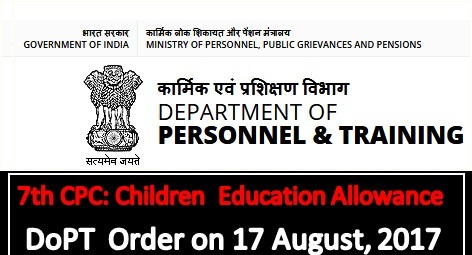 and Pensions, Department of Personnel & Training has issued Office Memorendum on 16 August,2017 regarding Implementation of decision relating to the grant of Children Education Allowance based upon recommendations of the Seventh Central Pay Commission. Further, reimbursement will be done just once a year, after completion of the financial year. For reimbursement of CEA, a certificate from the head of institution, where the ward of government employee studies, will be sufficient for this purpose. The certificate should confirm that the child studied in the school during the previous academic year. For Hostel Subsidy, a similar certificate from the head of institution will suffice, with the additional requirement that the certificate should mention the amount of expenditure incurred by the government servant towards lodging and boarding in the residential complex. The amount of expenditure mentioned, or the ceiling as mentioned above, whichever is lower, shall be paid to the employee. Reimbursement will be done just once a year, after completion of the financial year. For reimbursement of CEA, a certificate from the head of institution, where the ward of government employee studies, will be sufficient for this purpose.